A review of the movie Memento, directed by Christopher Nolan and starring Guy Pearce, Carrie-Ann Moss and Joe Pantoliano. One of film director Christopher Nolan's earliest movies has since become a classic in its genre. 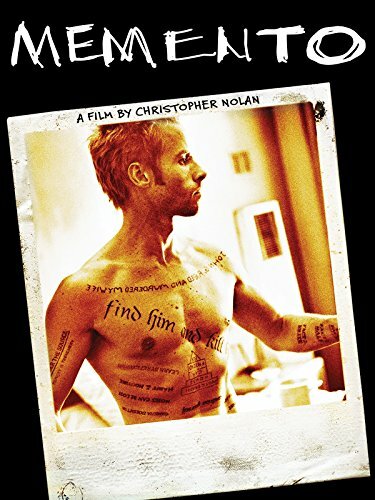 Possibly better known for his directorship of several of the recent Batman adventures, Nolan's wonderful 2000 film Memento is based upon a short story written by his brother, Jonathan. 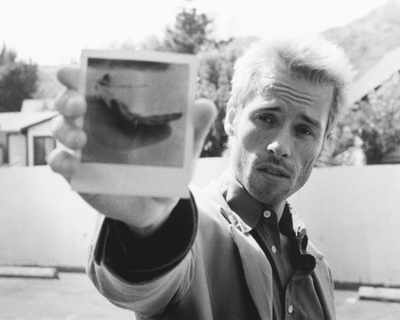 It stars Guy Pearce as a man suffering from anterograde amnesia, following a burglary in which his wife is raped and murdered. His condition, a result of head trauma during the attack, means that he is no longer able to create new memories. 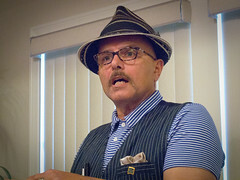 In his search for the man who he is convinced is responsible for his wife's death, he creates a system which allows him to recall people and events. This system involves tattooing his body and recording important memos on photographs and notelets. So, while others remember him, he does not know who to trust. Is he talking to the killer? Does he even like this person? Each time, he has to check pictures and notes to make certain of the reliability of those around him. What makes this movie unique is that the audience never knows anything more than Leonard, Guy Pearce's character. Why? Because the story is told backwards. For instance, in one part of the movie Leonard is seen in conversation with someone who knows him, but we can't be sure whether this person means him harm or not. Later, an earlier meeting of the pair sheds more light on their relationship, while how they came to meet is revealed even further into the movie. You just have to wait until the final scenes before everything unravels. Constructing the film in this way makes for fantastic suspense. It's certainly different from your usual thriller and will keep you guessing until the very end. You may even feel a certain amount of frustration, because events are not fully formed as the movie progresses. This is the way it should be though: we become a part of Leonard and share his irritation. Also a big part of Leonard's world are Natalie and Teddy, played by Carrie-Anne Moss and Joe Pantoliano. Both give stellar supporting performances, adding much to the suspense and claustrophobic atmosphere. It's certainly a story that thrills, but one which you won't forget in a hurry. 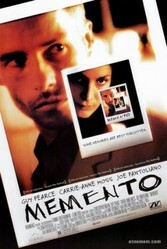 As with all good movie promos, this one for Memento strips down the story just enough to draw you in to want more. Please be warned that because of its R-rated content, it also contains short scenes of violence and the occasional profanity. It's just unfortunate that I lost my copy of the movie in a recent house move. Watching this again confirms to me what a great movie it is, so I'll be replacing my DVD very soon. A review of the classic horror movie, Carrie, starring Sissy Spacek and Piper Laurie. Thanks for dropping by. Please leave a note in the guest book to share your thoughts. A review of the 2019 thriller starring Stanley Tucci and Kiernan Shipka.